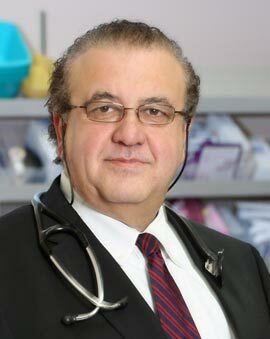 Like all of Commonwealth’s physicians, Dr. Bachar Kassem has a strong grounding in cancer research. At the National Institutes of Health in Bethesda, Maryland, he was involved in immunology research on both natural killer cell activity and antibody dependent cell mediated cytotoxicity. Dr. Kassem was awarded the American Society of Clinical Oncology Merit Award for Young Investigators. Dr. Kassem completed his training in hematology and medical oncology at the University of Pittsburgh’s Pittsburgh Cancer Institute and in internal medicine at the State University of New York. Dr. Kassem served as Chief Medical Resident at the State University of New York, where he was also an instructor in internal medicine. His medical degree is from the Tichreen University School of Medicine in Lattakia, Syria. Dr. Kassem has traveled widely throughout the world but loves calling Somerset his home.